Let’s start with the main character: he’s autistic. Not an insult, the character just has all the typical traits of a Hollywood movie autist: he’s twitchy, can’t look anybody directly in the eye, is blunt and socially blind, and is a bit of a weirdo. All of this is really distracting and off-putting. Basic Advice: Never make the weirdo the main character of your book or movie. It so very rarely works out, and most of the time it alienates the audience, preventing them from getting into the story (much of the time without ever realizing what’s wrong). Who’s the main character in Charlie and the Chocolate Factory? Charlie. Not Willy Wonka, not an Oompa Loompa, just Charlie. Who’s the main character in Harry Potter and the…? Harry Potter. Not Luna Lovegood (the platinum blonde super-weirdo), just Harry. Lovegood is great as a comic relief character, for a few minutes here and there, but if you had to spend 15 hours with her, you’d probably end up hating her and the movie. Well, Newt Scamander is the Luna Lovegood of this series, and he’s the main character. It’s a mess. Moreover, Scamander is so deeply involved in the magic world that he has a suitcase AND a house with multiple gigantic extradimensional spaces in which he’s built artificial biomes in to keep a myriad of fantastic beasts in. It’s MAGIC MAGIC MAGIC!!!!!!!! !, except that it’s not even magical. The original “Harry Potter” movies revolve around a completely normal kid, wholly ignorant of the Wizarding World, who is suddenly introduced to the fantastic and fantastical. He’s just as flabbergasted and enthralled as the audience was supposed to be (and most were). What enthralled the audience wasn’t just the magical elements of the movie, but the emotional journey they took along with the character. Seeing emotions in someone tends to evoke emotions in ourselves. This is the entire basis of fiction and drama (and empathy and sympathy): when a character is terrified, we feel a little of that terror. When they’re excited, we feel a little of that excitement. And when they’re awed by the magical world, we feel a little of that awe. Conversely, when a character is unimpressed or even bored by the fabulous and amazing, the audience feels a little of that boredom. The movie had some SPECTACULAR special effects, and some cool and imaginative magical devices, creatures, spells, and so forth. Despite that, I wasn’t thrilled at all. Because this was routine to Scamander, even boring, none of this was magical or wondrous to me. This phantasmagoria of imagination and effects was routine and boring. 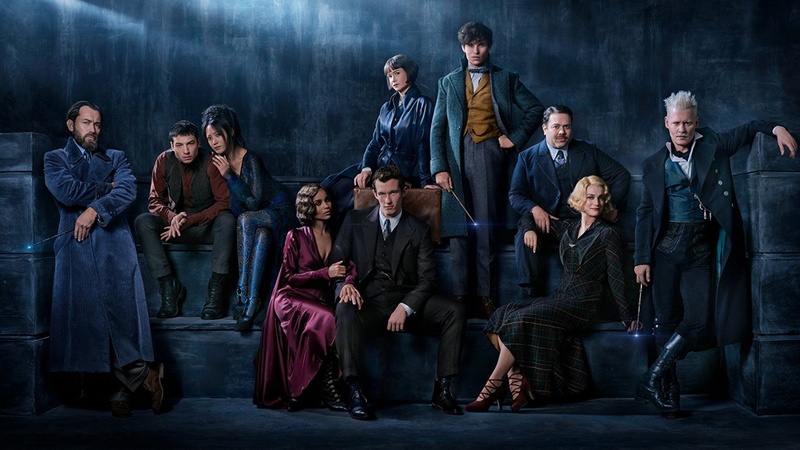 So not only is Scamander an offputting, twitchy, socially inept loser (who literally can’t get a date with the movie’s hottest chick, played by Zoë Kravitz, when she’s—against all logic—standing directly in front of him asking him to sweep her off her feet and carry her away), it’s also a bottomless pit of wasted imagination and special effects. All of that because of one single mistake: Scamander shouldn’t ever have been the main character. Is there an otherwise mundane character, someone unused to the Wizarding World, someone who could feel awe and wonder? Maybe a character who is a regular guy? Someone who even gets the girl? Why yes, there is. Baker Jacob Kowalski, the bumbling sidekick from the previous movie, is (potentially) the perfect protagonist, the perfect window into the wizarding world, the perfect non-annoying and non-offputting protagonist the series needs. In the first movie Kowalski, as a non-magician, could have been swept up in the aftermath of Scamander’s accidental release of magical creatures into New York City. Thrown in with the magicians, he could have learned about the world, rose above the circumstances, stood his ground and showed his bravery, and eventually won the day by using some small piece of magical lore he’d picked up along the way. Scamander could have been his flaky and unreliable guide, necessary to recapture the animals, but not someone to rely on or really fully trust. Blue collar would-be-baker Kowalski—the unlikeliest of heroes—saves the day, Queenie falls for him, they supposedly get obliviated, but the last scene of the movie shows he remembers everything, especially the beauty who’s in love with him. In this movie—the escape and rise to power of Wizard Hitler, complete with a Wizarding World Reichstag Fire—Kowalski could have served much the same role. Forbidden to marry in the US, the two go to Europe, where such shenanigans are allowed, and get caught up in another of Scamander’s outrageous adventures. Once again Kowalski (ever the unlikely hero) is in over his head, but his doughty heart—belied by his doughy exterior—sees him through, and he rises above the circumstances and again triumphs. He and Queenie are married, and despite the fact that Wizard Hitler escaped, he earns his happy ending. Grindlewald has a lot of problems, but most of them are peripheral. The core problem is that Scamander, for all that Rowling identifies with him and is enamored of him, is just not the right character for this series to revolve around. With all this magic, the core needs to be grounded, and Scamander simply could never serve to ground the film. Adventure stories need heroes, even unlikely heroes, and Scamander is only a sidekick. JKR also threw the canon out the window. The movie takes place in 1927. McGonagall is apparently in it. But according to Order of the Phoenix she was born in 1935. Same is confirmed by Pottermore. So, yeah, I got nothing, other than JKR is really bad at knowing her own canon, which, given that the books got worse with each iteration, leading to the utter sh*t show called Deathly Hallows, should not surprise. Or it’s supposed to be a different McGonagall? One of her parents? Everybody’s related in this crap. In the last shot of the first film we do see Jacob regain his memory, as an FYI. Jacob is the heart of the first movie. It’s not a big surprise they want to ignore the whole amnesia bit. The movie series is coasting on HP inertia anyway, though; it’s not a fantastic standalone story. Jacob makes it better, Newt makes it happen, but it’s still just… there. The point of this film is Orange Man Bad… DUH! Boring show. I could care less about Yet Another Voldemort because we know he fails. There’s no risk here. No, the series should be Newt and Jacob on magical misadventures, a Sherlock Holmes sort of idea where Newt’s skills lets him discover clues but Jacob puts it together and solves the problem with a nonsense, can-do attitude.